3. The story of Monowi, Neb., which is really the story of Elsie Eiler, because she is the last remaining resident in a town of one. 10a. But before it was… some of the best shakes from around the world. 2. 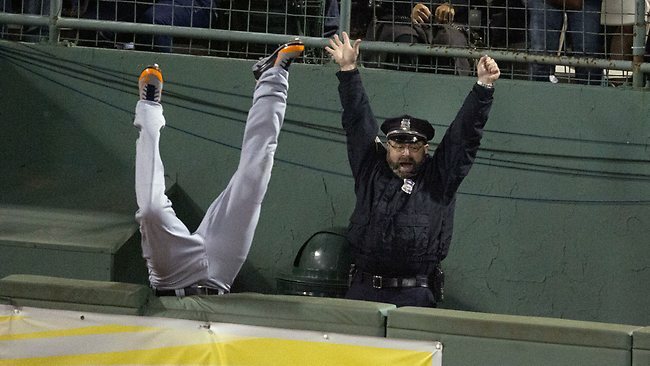 The sports photo of the year – Boston bullpen cop Steve Horgan celebrates a David Ortiz grand slam during the American League Championship Series as Detroit Tiger Torii Hunter flips over the outfield wall trying to make the catch. The Red Sox went on to win the game, the pennant, and eventually the World Series.